After successfully subcontracting to the Shepherd Group for the materials handling contract for Drax Power Station on 3 concurrent projects at Drax Selby site for its main ECO-Store, boiler distribution system and co-fire system, material handling company George Robson & Co Ltd is close to the first milestone handover. George Robson & Co, based in Sheffield, UK, is responsible for the project, which includes a complex array of towers, buildings and conveyor systems that are mounted within open gantries up to 60m high. The gantries enable the conveyors to convey the biomass across the site, bridging roads and railway lines. The high speed weather-proof trough belt conveyor systems provide inflight screening, ferrous removal weighing, sampling in accordance with OFGEM, ATEX and Board of Trade weighing system requirements. The system receives biomass from sub-ground level via a dedicated dual rail unloading facility. The dual redundant conveyor line can deliver 2,800 tonnes of material per hour. From rail unloading through to boiler distribution, the conveyor system covers 3.5km of length. The structures enable the conveyors to convey the biomass material from the sub-ground level up to 80 metres in height, providing chute work and diverting systems to route the material to any one of four storage domes. Discharged by a vibrating floor, the material stored in the domes is fed to the out feed conveyor system. The conveyor system’s complex design enables blending of product between silos; this ensures the product is free from degradation and self-combustion. The arrangement of divert valves also enables a direct route from rail unloading to the boiler distribution system. The project involved the installation of 28 conveyors, totalling 3.5km in length with a total belt length of 7.9km. The conveyors will transport fuel from trains into four special domes which can hold up to 75,000 tonnes of biomass each. The domes themselves were built in a unique way — giant ‘balloons’ were blown up from the ground then each one was sprayed from the inside with concrete. Each one is 55 metres in diameter and 60 metres high. The conveyor sections, designed and installed by Robson, were fitted within the gantries on the ground then lifted as a 140-tonne section using one of the largest cranes in the world. The rising height from the first conveyor below ground to the highest point is 80 metres. The conveyor system will enable 2,800 tonnes of biomass pellets to be transferred per hour. The biomass dust is explosive. Therefore, the conveyor system has undergone a rigorous assessment to ensure they meet the ATEX (Explosive Atmospheres) standards, which ensure the safety of the plant and personnel. The biomass is derived from waste wood, grain husks, nut shells, and forestry waste and among many other natural materials and is prone to additional metal object such as tramp steel, nails and nut and bolts. To ensure safety, the biomass must be free from foreign objects that may damage the firing process, or possibly cause heat or sparks along the conveying process. Robson utilizes a series of overband magnet separators to remove ferrous metals and disc screens to limit oversized lumps or other objects that may cause blockages in the chute work. The company offers expertise in many industries, including: power generation — biomass systems; airports — baggage handling systems; sugar industry; glass industry; environmental waste — sewage, ash; cement; and raw material handling. Among its major customers are: British Airports Authority; British Sugar;Tate & Lyle;United Sugar;Alstom Power;Drax Power Station; Fiddlers Ferry Power Station — Shepherd Group. Geo Robson & Co turns over between £12 million and £18 million a year, and has 110 employees. The combined resources of the Robson Group have the design, engineering skills and experience to handle complex projects over a diverse range of sectors. The companies can facilitate the production of a wide range of Structural steelwork and fully integrated mechanical handling systems, including projects requiring high added value engineering content. Proven group strengths include: consultancy; feasibility; design engineering; fabrication/manufacture/test; electrical control systems; site service and maintenance; structural steelwork and stairs access; tubular and gantry constructions; bulk handling systems; performance and value; multi-sector presence; project completion track record; health & safety record; capability and flexibility; customer-focused project managers; and financial strength. Specialist engineering business Spencer Group has delivered the first project as part of a £150m investment in biomass handling operations at the Humber Ports in the UK. Spencer Group has designed and constructed an impressive facility at the Port of Hull, showcasing the company’s multi- disciplinary engineering expertise in a field in which it is a UK leader. The facility is the first to be completed to support a 15-year contract between port operator Associated British Ports (ABP) and Drax Power Limited to enable sustainable biomass to be transported to Drax Power Station near Selby, as part of an ambitious programme which will see Drax transform into a predominantly biomass-fuelled generator within a few years. Work began in April 2013, with Spencer constructing biomass handling, storage and discharge facilities, as well as associated infrastructure. Despite the complexities and challenges of the project, the facility became operational in time to play a part in a visit to Drax Power Station by Energy Secretary Ed Davey in December 2013 to officially open the new biomass facilities supporting the first generating unit converted to burn sustainable biomass in place of coal.The Energy Secretary saw Drax-branded rail wagons carrying biomass loaded at the Port of Hull facility arrive at the power station for delivery into the biomass converted unit. The port facility has now been handed over by Spencer to ABP, the project having been delivered on programme and within budget. The centrepiece of the development is a silo tower in a prominent position close to the main road from Hull’s docks. At 50 metres (164 feet) high it is one of the tallest structures on the city’s skyline. The facility will handle 1mt (million tonnes) a year of biomass imported by sea from the United States and Canada in the form of wood pellets created from sustainable forestry residues and thinnings. The biomass is stored in warehouses before being delivered by truck to the new facility and unloaded into feeders which take it to a 250-metre (820ft) conveyor, carrying it to the top of the silo. The silo is capable of storing up to 1,800 tonnes of wood pellets and is filled by 60 truckloads of biomass over a three- hour period, twice a day, loading at the rate of 600 tonnes an hour. Sophisticated technology ensures an even load as the biomass is discharged into rail wagons which pass through the base of the structure at crawling speed. The automated system is capable of loading up to 25 rail wagons with 1,625 tonnes of material in just 45 minutes. Gary Thornton, Chief Operating Officer of Hull-based Spencer Group said:“We are delighted to have met the expectations of our client, ABP, with the successful delivery of this complex and challenging project. It has employed our multi- disciplinary engineering expertise to best effect, with rail, civil, structural, electrical and mechanical engineers all involved. “We are especially pleased to have worked so constructively with ABP and Drax on the first project to be delivered as part of the major investment being made in the Humber Ports to support the phased conversion of Drax to a predominantly biomass-fuelled generator. Philip Hudson, Drax Director of Corporate Affairs, said: “With its headquarters in Hull. Spencer Group was geographically well placed to take on the project, supported by a trusted and reliable local supply chain. Spencer also offered design and build expertise and the ability to mobilize and deliver the project rapidly to meet the requirements of Drax and ABP. Simon Brett, Head of Projects, Humber, for ABP, said: “Spencer has delivered a design and build project to meet the requirements of both ABP and Drax Power, in the transportation of biomass from the Port of Hull to Drax’s power station near Selby. The Port of Hull facility reinforces Spencer Group’s reputation for pioneering projects in the green energy field. Flagship schemes have included designing and building a biomass reception, handling and storage facility at Drax Power Station in 2010 and, in the same year, a biomass rail-loading facility at the Port of Tyne, which was then the first of its kind in the world, again to serve Drax. The port investments are generating about 100 jobs during construction, with an additional 100 jobs created once all the facilities become fully operational. The largest is an investment of around £125m in a dedicated import facility, the Immingham Renewable Fuels Terminal (IRFT), which is due to be completed later this year. IRFT will handle bulk carriers bringing up to 3mt of wood pellets a year into the port, destined for Drax Power Station. The new facilities underline the Humber’s reputation as the UK’s Energy Estuary, with a quarter of the country’s energy needs generated in the region, or supplied through it. ABP is the UK’s leading ports operator.ABP’s Humber ports play a crucial role in delivering national energy security and are at the forefront of supporting Britain’s transition to low carbon and new renewable energy generation. Spencer Group delivers innovative engineering solutions across the energy, transport, industrial and infrastructure sectors, from initial design concepts through to construction, and specializes in logistically complex schemes. Spencer delivers world-class engineering projects through a dedicated in-house development team, which combines innovation and value engineering to drive schemes forward. As a client-focused organization, Spencer utilizes its substantial knowledge and experience to deliver effective solutions and advanced engineering technology for clients. Spencer’s value proposition combines demonstrable expertise with forward- thinking systems, enabling a dedicated, collaborative relationship throughout projects. Founded by Chief Executive Charlie Spencer in 1989, the entrepreneurial company has grown rapidly and now has a£150m turnover and workforce of more than 500. The company has its headquarters in Hull, with offices in London and Glasgow. The company has substantial renewable energy activities and exceptional green credentials. It was named Humber Renewables Large Business of the Year in the Humber Renewables Awards 2013 and claimed the prize for Best Renewables Project for the Port of Hull biomass facility in the same awards in 2014..
Spencer Group has an outstanding track record of applying engineering expertise to the renewable energy field. Flagship projects have included designing and building a biomass reception, handling and storage facility at Drax Power Station in 2010 and, in the same year, a biomass rail-loading facility at the Port of Tyne, then the first of its kind in the world. Spencer Group has designed and built landmark structures across the UK, including the York Millennium Footbridge, Glasgow Science Bridge, and three control centres for Network Rail. The company has a division focused on the rail sector and is a principal infrastructure contractor for Network Rail, operating nationally. Spencer sets industry-leading safety standards and is highly trusted to deliver complex rail infrastructure projects. Spencer Group is a world expert in high-level bridge works, having developed a gantry system to enable vital dehumidification work to prevent corrosion of cables on the Severn, Forth Road and Humber suspension bridges, as well as the Alvsborg Bridge in Sweden. It has also been appointed to carry out the largest retro-fitted bridge dehumidification project ever undertaken globally — on the East Bridge in Denmark, the third largest suspension bridge in the world. The business is also active in the nuclear power field, working on decommissioning projects within a 10-year Magnox framework. ABP is the UK’s leading ports operator handling around one quarter of the nation’s seaborne trade. network capable of handling a vast array of cargo. ABP is backed by investment in modern facilities and equipment, and supported by experienced staff. The group’s other activities include rail terminal operations (Hams Hall), dredging (UK Dredging Ltd) and marine consultancy (ABPmer). ABP’s port estate totals 5000ha, including some 900ha of development land at key strategic locations around Britain. ABP’s assets include: v 87km of quay; v 1000ha of open storage; and v 1.4m2 of covered storage. In 2012 ABP handled over 115,000 vessel movements. Over the next five years,ABP plans to invest over £450 million in a wide range of major projects across the group. The Port of Southampton handles more than 600k cars per annum mainly for the export market including Jaguar Land Rover, Honda and Mini and ABP is investing in the building of its fifth multi-deck car facility on the Southampton port estate. The four ports of Grimsby, Immingham, Hull and Goole handle more than 65mt of cargo between them each year. Grimsby and Immingham form the UK’s biggest ocean gateway and move around 53mt of cargo per annum. A total of £125 million is currently being invested in a biomass handling terminal in Immingham, in a Humber-wide agreement with Drax that has seen a further £25 million invested in the biomass handling facility in Hull. The Immingham Renewable Fuels Terminal will handle sustainable biomass shipments and will create over 100 permanent jobs once complete. The construction phase also created 100 employment opportunities. The Port of Hull handles 10mt of cargo per annum and is the is the focal point for the planned development of the UK’s largest offshore wind turbine manufacturing facility at Green Port Hull, which will be located on the Port’s Alexandra Dock. This new manufacturing facility represents a £200 million investment and could create up to 2,000 direct jobs. The new Grimsby River Terminal represents an investment of £26 million and will allow large car-carrying ships to berth outside the port’s lock system. This development confirms the port’s position as the UK’s leading automotive handling facility. More than the equivalent of one million TEUs (twenty foot equivalent unit) of unitized trade is shipped through ABP Humber ports. Ro/ro and container traffic represents more than 30 sailings a week to Europe, Scandinavia the Baltic and beyond. The Humber ports handle more than 70 freight train movements per day. Goole is situated 50 miles upriver and is the UK’s premier inland port. It handles over 2mt of cargo annually. In incinerator plants, waste is used to generate electricity and heat. PEINER SMAG Lifting Technologies has designed and refined the MMGL-4 product series of PEINER grabs for the handling of waste and renewable raw materials. This product series has proved its worth in incinerator plants worldwide and is an established fixture in the market. The PEINER grabs boast a wide range of technical features that are major advantage when being used in incinerator plants. For example, hydraulic pipes, electrical wiring and connections are fully protected. The cylinder barrel and piston rod are additionally protected against mechanical damage. The cylinders are fitted with oil damping at the end of the travel to reduce noise and increase durability. The inside and outside shell plates are made of highly wear-resistant special steel 400 HB. The self- regulating pump, with its integrated power regulator, ensures improved energy efficiency, protecting the motor and obtains optimal closing forces. The grabs can be supplemented with further optional accessories: oil level watch and switch, oil tank thermometer and heater, inclination sensor in the control cabinet, central lubrication, as well as thermal protection for the engine. The MMGL-4 product series of PEINER grabs are operated in both reversing operation and continuous running operation according to DIN EN 60 034. They can be operated in fully- automatic, semi-automatic and multi-shift mode. Combustion residue from an incinerator plant is temporarily stored in the so called ash bunker and then disposed of. PSLT has developed the PEINER motor dual scoop grabs, MTGL-3 product series, for work in the ash bunker. This product series is characterized by a large opening width and strong closing forces thanks to its four cylinders. The inclined position of the cylinders keeps the height to a minimum. As the grabs are also used below the ash bunker, pipes, wires and connections are fitted with all around protection that prevents dirt from entering the hydraulics. The PEINER ash grabs are equipped with exchangeable teeth that tear partially hardened and crusted surface apart and guarantee optimal filling. Hydraulic loading machines are frequently used to sort waste and feed shredders. PSLT offers the PEINER hydraulic grabs as accessory equipment for this purpose. PSLT also delivers appropriate grabs for the handling of wood chips, wood pellets and other raw materials, e.g. PEINER motor dual scoop grabs and PEINER four-rope grabs. From Barnual, Russia in the East to Dublin in the West, Lachenmeier Monsun has delivered solutions for inland terminals, port terminals, power plants as well as wood pellet/wood chips plants. These solutions for bulk handling and the storage of biomass fuels all offer high performance, 365 days a year, 24/7. Lachenmeier Monsun works with three different customer categories within the biomass segment: wood pellet/wood chip plants, power plants and bulk terminals. Of course, demand differs from segment to segment, but in all three categories a certain trend prevails — i.e. increasing capacities, longer and higher conveying equipment, increased automation of processes and easy maintenance. “When it comes to helping customers stay competitive we at Lachenmeier Monsun feel confident spreading the word on some good cases,” Christian Ørskov Pedersen explains. A completely new port terminal was opened in June last year in Gdansk, Poland. The terminal is truly a multi terminal that handles bio products as well as feed and grain products with flat storage in three sections, five silos and a dryer with pre-cleaner. Gdansk Bulk Terminal is a flexible and future-proof multi terminal with intake from ships at 200tph (tonnes per hour), shiploading at 450tph plus two intakes from trucks each offering 150tph, and truck loading at 180tph. In Leipaja in Latvia, the Dan Store Terminal serves as a an outlet for agricultural trade in the region and handles wood pellets for bio fuels. Since vast areas in Latvia and neighbouring countries are covered by forests, there is great potential for increased wood pellet production in that area. With ship unloading at 600tph; two railway intakes (200tph and 500tph respectively); two truck intakes, each 500tph; three flat storage facilities totalling 66,000 tonnes; six silos totalling 24,000 tonnes; conveying capacities from 170–1,000tph; shiploading at 1,000tph; and railway loading at 200tph, the terminal is set for the future. In 2010 Vyborgskaya Cellulose inaugurated the world’s largest wood pellet plant (see picture on p77). The massive plant was projected to produce 1mt (million tonnes) of wood pellets per year. As subcontractor to Andritz Feed & Biofuel, Lachenmeier Monsun designed and manufactured the in-feed line for raw materials such as chopped wood chips and sawdust with a capacity up to 600m3/h. It also designed and manufactured the conveying lines for pellets from cooler to storage — two lines offering 250m3/h each. For the storage and truck loading plant, Lachenmeier Monsun directly supplied a complete conveying system up to 500m3/h and a storage system with two 7,500- tonne silos, temperature monitoring system, sweep augers, bulk scale system, and loading system for trucks in 4×4m2 silos. When DONG Energy in Avedøre back in 2010 expanded the wood pellet storage facility, Lachenmeier Monsun was a main supplier. The pellet silo has a capacity of 100,000m3 and a 1,000m3/h filling capacity. The installation includes 15 internal chain conveyors with integrated receipt pits and drive over grids. A belt conveyor in the centre below the silo conveys the discharged wood pellets to the boiler house via the existing belt conveying system. Bulk handling of wood pellets and wood residue differs from other bulk material. The structure of the woody material is typically coarser and more uneven, and not quite as free-flowing as e.g. grain, so particular attention must be paid during handling and storage. To ensure trouble-free operation, Lachenmeier Monsun has designed special conveying equipment for uneven materials as is often the case with woody biomass products. Another factor that calls for attention when handling and using wood pellets and wood residue is explosion prevention. At Lachenmeier Monsun, this risk is considered very seriously, and as early as possible in the design phase. Venting is a method that is easy applicable to bucket elevators to prevent a potential explosion in developing into a hazardous situation. The pressure from the potential explosion is relieved through venting panels. With a flameless venting solution, venting can even be done indoors, with no release of flames to the surroundings. A special device that extinguishes flames is bolted directly onto the explosion vent. Lachenmeier Monsun has recently delivered equipment for a new wood pellet plant to Sweden, with both venting and suppression technologies. The World Bio Energy in Jönköping in Sweden (3–5 June) is a gathering point for the industry. Lachenmeier Monsun will demonstrate a range of technologies within high performance conveying equipment and discuss explosion relief technologies, too. With more than 50 years of expertise, Lachenmeier Monsun A/S has developed a unique expertise in customizing solutions for the industrial handling of feed, grain and biomass products. Who says waste can’t be a thing of beauty? Barrier-free utility and amazing aesthetics merge to create biomass storage and processing under long span domes, writes Melanie Saxton of Geometrica. ‘Beauty’ and ‘waste’ are seldom mentioned in the same breath—except when in the presence of a Geometrica waste management structure. Design, vision, environmental impact... all are elements necessary to develop clean, efficient biopower. Geometrica specializes in domes that make these ‘green’ initiatives possible in the UK, Qatar and all over the world. The importance of biomass and biopower simply can’t be overemphasized. No longer a dirty word, ‘waste’ is processed as a renewable and clean energy source in municipalities worldwide. Nearly everyone is on-board with recycling, re-using, re-purposing and reclaiming disposable items previously doomed to landfills. Communities are making a shift to sustainable energy sources through the processing of plant and animal matter, as well. Biomass has become more manageable — and more useful — through biopower technology. The delivery, processing and storage of biomass has certainly evolved according to Francisco Castaño, president of Geometrica. He notes that aesthetics and sustainability are a double-edged positive that has entire nations looking at power sources through a new lens. Biomass can be processed, stored and distributed beneath long spans of thoughtfully designed waste management infrastructure. These types of efficient domes are exemplified in the Marchwood facility, a prime example of biomass processing and storage in the UK (see ‘A jewel off Southampton Water’, on pp115–116 of the March 2012 issue of Dry Cargo International). Castaño. It is, instead, a complete power plant that spans 100m and supplies electricity to more than 22,600 homes. The energy recovery project proves that social value and careful design can elevate even a waste treatment facility into a thing of beauty. The dome, designed by renowned French architect, Jeanrobert Mazaud, now conceals and beautifies an incinerator facility, with only the twin chimneys stretching upward through the elegantly curved roof. The original concept, if built with conventional hot-rolled steel, called for more than 1,000 tonnes of superstructure. The Geometrica dome, using galvanized structural tubing joined with high-strength aluminium hubs, weighs less than 300 tonnes. facility is a leading example of environmental practice and quality handling of biomass, and won the 2009 Best Designed Project Award by Partnerships Bulletin (formerly Public:Private Awards). But the real prize is that nearby families are now warmed by newly generated power as an industrial jewel graces Southampton Water. separation and recovery of resources and energy from waste, including sorting, mechanical and organic recycling, and waste-to- energy composting. The goal? To have these processes work together synergistically, complementing and feeding off one another to support increased energy and material recovery from households, commercial establishments and the construction industry. The side benefit included a surplus of multiple dozens of megawatts to the national grid. Early in the construction process, Keppels Seghers, a Singaporean engineering firm, was contracted to design, build and operate the DSWMC’s Green Waste Storage Composting Plant. The company sought a roof structure which processes yard and garden waste, tree cuttings, as well as food and kitchen products such as expired vegetables or peels. The material is subsequently shredded, screened and stored inside the Green Waste Storage facility. Grab-cranes then feed the material into anaerobic digesters which further break down the waste and produce biogas, which is eventually translated into a form of power generation. The Qatar Freedome is rectangular in shape and sits on a concrete perimeter that varies in elevation. The dome is almost 20 metres tall above its support wall, is clad in with 3,384 panels of painted steel, and covers 1,923m2 of area required to house the Green Waste storage and its various sorting and shredding machinery. According to the Qatar Green Building Council Solid Waste Interest Group, the DSWMC composting facility is the largest composting plant in the world, and Geometrica’s unique structural system of creating long-span structures offered the ideal cover for it. The DSWMC first began operation near Mesaieed, Qatar, in October 2011. The facility treats and processes domestic solid waste for the whole of Qatar, recycling select materials and using organic waste and biomass to generate various forms of energy. More than 95% of the waste is reclaimed or converted into energy, with less than 5% of the materials entering the facility diverted to a landfill. The facility is capable of treating up to 2,300 tons of domestic solid waste per day, and incinerates approximately 1,000 tonnes of other waste. Geometrica designs and prefabricates domes that may be single- layer, double-layer vierendeel, double-layer truss, or ribbed. Lighter or heaver structural density may be achieved by varying the section of the tubes, or the length of the members. Regardless of geography, terrain, weather conditions or corrosive factors, Geometrica can design a waste management dome that helps improve the carbon footprint of the facility. With the world focusing on climate change, the need for renewable energy has led to the use of many agricultural products being grown and converted into biomass for consumption by power stations in a bid to reduce emissions and their usage of coal. Inspectorate has, for many years, been involved in the inspection of biomass products as well as the traditional coal and coke trade. In the USA, the company represents suppliers and buyers right across the North American region. Because of the increasing export of wood pellets, Inspectorate is actively expanding its inspection network across the Gulf, East Coast and Canadian ports. To complement its inspection operations, Inspectorate is installing a new sample preparation facility in Port Arthur,Texas and a new solid fuels laboratory in La Place, Louisiana. It is Inspectorate’s aim to cover all wood pellet production and load-port locations which currently includes Vancouver and Prince Rupert on the West Coast of Canada; Belledune, Quebec (new office) and Montreal (new office) on the East Coast of Canada; Port Arthur, New Orleans, Mobile and Panama City in the Gulf Region; and Brunswick, Savannah and Chesapeake on the East Coast of the US. Inspectorate also provides discharge inspection and testing services at the major European Ports in UK, Belgium, Holland Germany, Italy and Denmark. American wood pellet market and is developing its operational network to meet the demands of a young industry and many new customers.” says Fanie Nel, Metals & Minerals Vice President for the Region. TRAMCO, based in Wichita, Kansas, USA, is an established manufacturer of bulk material handling equipment. The company has recently expanded its focus into the biomass sector. For more than 47 years,TRAMCO has had a reputation for providing high-quality equipment at competitive industry prices. Its product line includes the most complete line of chain conveyors, enclosed belt conveyors, specially designed conveyor and conveyor conversions. Each available in several models with features that meet the specific individual needs of the customer. TRAMCO is continually modifying its equipment to adapt to the ever-changing industry demands of tomorrow. With equipment in operation worldwide,TRAMCO expanded its resources to the TRAMCO UK manufacturing facility that supplies the EU with European-spec equipment. As a noted supplier of bulk material handling,TRAMCO continues to produce high quality, reliable equipment that meets specific customer needs. The Georgia Biomass project provided an excellent opportunity to showcase the TRAMCO quality to the wood pellet industry. Georgia Biomass is owned by the German energy company RWE Innogy, whose business area is sustainable energy. It has built up its production plant into one of the world’s largest manufacturers of wood pellets. TRAMCO’s conveying equipment is an integral part of wood fibre handling, wood pellet and reject material systems. To meet the demand of this project, drag style ‘G’ conveyors along with TRAMCO bucket elevators handle the material as soon as it enters the pellet plant travelling to and from hammer and pellet mills and then on to storage. The facility’s wood pellet production is approximately 750,000 tonnes of pellets per year. Georgia Biomass is the largest, most modern facility of its kind in the world, and is a major source of sustainable renewable power generation in Europe. In recent years, Blug Credeblug’s expertise and experience in handling biomass has increased significantly, resulting in a greater presence in the ports and power generation sectors. In the next 20 years, it is expected that the biomass business will grow by 210% in the European Union (EU). Biomass is already an important product in the bulk industry. Blug offers a wide range of solutions for biomass handling, depending on the production requirements. From closed-design orange peel grabs to CM4, CV2 or C4 type clamshell grabs, different solutions can be used to handle a reference material with a density value of 0.15-0.3t/m3 — which can vary depending on moisture, size and compaction factors (see image 1, above). material characterization: bulk handling needs detailed material properties definition for perfect integration with a grab’s movements and shapes. Computational fluid dynamics (CFD) simulations give accurate information about the material behaviour identifying most abrasive areas to be considered and are a cost-effective way to optimize a grab’s design (see image 2, below). Nowadays, wear-resistant materials (Hardox type) are standard, but other possibilities like austenitic stainless steels are a good option to avoid corrosion and friction increase. Blug’s design stage starts with a complete material characterization (flow patterns, granulometry, density and compaction factor, moisture content...) so that CFD and finite elements simulations can show relevant information for a better material flow and grab’s payload. dust control: environmental protection is one of the key aspects to consider during the design process, and it is probably the main disadvantage for crane-grab type bulk unloading versus continuous ship unloading systems. The grab’s special valves sealing and closing structure complement Blug’s dust-control features, together with shape optimization by preventing material degradation during continuous handling cycles. penetration volume: defined by valves/arms outer surface in open position and grab’s penetration depth before closing. dragging volume: the material that’s delimited by the valves/arms edge during closing movement. Dragging volume is a fixed parameter limited by the grab’s size and geometrical conception, whilst penetration volume can change substantially due to grab working inclination, material compaction or crane operator ability. Blug grabs’ volume definition is always based on dragging volume so that high loading values can be regularly assured minimizing production non-controllable variables. crane integration: once a grab’s loading features are correctly specified, Blug grabs are adapted to their operating crane(s) working and connecting characteristics. Other aspects like climate conditions and vessel type should be also considered so that grab operation can be fully integrated and offer long-term productivity lifecycle. Blug references are classified as A8/M8 design according to FEM 1001/1998 standard. modularity and operational flexibility: grabs return on investment delay can be significantly reduced if the structure can be modified by detachable plates or arm replacement and use same motion system to handle different density and shaped materials. Blug products’ design is based on a modular conception so that grab’s structure could be easily transformed (see image 3 below). In the last few months Credeblug’s activity has been strongly related to biomass handling, providing three 12.5m3 grabs for the European market. Some important orders related with bio-fuel handling grabs for American port market will be manufactured within the next few months. 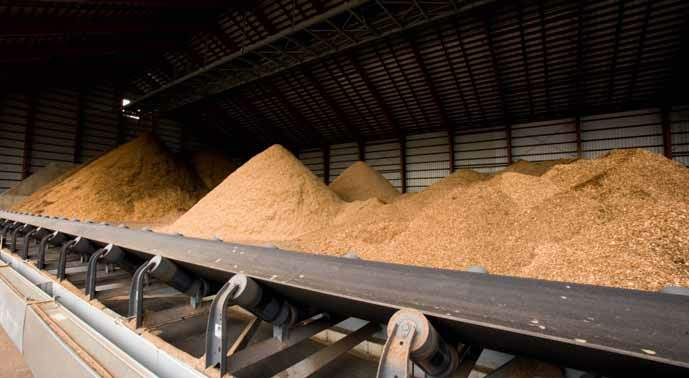 Biomass is a general term used to describe a variety of materials including wood chips, pellets, saw dust, milled switch grass and corn stover, etc. From a material storage and handling perspective, these materials can exhibit various handling challenges. Materials such as milled corn stover are very light and may experience discharge issues, whereas materials such as woodchips exhibit strong interlocking tendencies. Pellets may undergo attrition and generate dust, which can pose an explosion hazard. Whether it is gravity-reclaim stockpiles, silos or feed hoppers, unless properly designed, it can experience flow problems such as flow stoppages, limited live storage capacity, feed rate limitation, etc. Similarly, if the feeder and transfer chutes are not designed properly, they can result in flow problems. These problems can be avoided by properly designing or retrofitting the storage and handling systems. Established in 1966, Jenike & Johanson is a world-renowned technology company which provides solutions for reliable storage and handling of bulk solids. solids handling equipment failure investigations. Bulk solids handling problems are often the major cause of costly downtime and demurrage charges for many facilities, especially during start-up. These same flow problems continue plaguing on-going operations by limiting throughput and creating safety and health risks, as well as reducing equipment life, increasing maintenance costs and causing premature equipment failure. To address these costly problems, Jenike & Johanson has developed proven ways to design handling equipment that will promote reliable, smooth and unrestricted flow of bulk solids. Bulk solids handling equipment design should not be a trial-and- error approach; Jenike & Johanson doesn’t guess at material properties, it measures them. It has the largest and most complete laboratory in the world for characterizing the flow properties of bulk solids under representative environmental conditions. For over 40 years, Jenike & Johanson has focused on developing first principle theories on bulk solids flow and conveying behaviour. Jenike & Johanson combines test results and real world project experience, which yields the best solution in terms of reliability and cost-effectiveness. Its skilled and experienced engineers provide detailed structural and mechanical design of solids handling equipment, and routinely design silos, hoppers, feeders and transfer chutes. When it comes to dealing with dust emissions that occurring during the biomass handling and storage process, there are several technologies available. The PowerCore® technology, developed by Donaldson, offers specific advantages which result from the high efficiency of the new dust collector and innovative filter packs. This filtration technology has made it possible to reduce the construction volume of a dust collector up to 70% in comparison to traditional baghouses or cartridge collectors. filters of 2.4 metres in length. This results in the high power density of the dust collectors: a PowerCore VH dust collector for a flow rate of 23,000m3/h requires only 12 filter packs and 65% less installation space than a conventional filter system of the same capacity, which is equipped with 162 bag filters. The small construction size at high filtration efficiency and easy handling of the filter packs are the decisive criteria for users. PowerCore filter packs combine the proprietary Ultra-Web® nanofibre technology with the latest findings of filter media manufacturing, so that the particles are collected without depth-loading (Figure 4). This dust collection technology by Donaldson is a prerequisite for ‘downsizing’ in comparison to conventional systems with filter bags or cartridges. The filter packs are lightweight and can easily be handled by one person. While previously ten minutes were necessary to replace a conventional bag filter or cartridge, the time is now reduced to only two minutes with the PowerCore filter packs. At the same time, the filtration efficiency was considerably increased. Independent laboratory tests confirm: PowerCore filter packs reduce emissions by up to 78% when compared with standard polyester bags. All PowerCore dust collectors feature an innovative and highly effective cleaning mechanism with pulse shaping technology. The pulse flow effectively covers the entire filter pack and improves the filtration efficiency, keeping pressure drop low and increasing operational life. With these qualities and functions, the PowerCore dust collectors are well suited for the dust collection of processing units, conveying systems and silos for biomass products. From the view of the customers, they offer another advantage: With their compact size, economic operation and long life they fulfil the main criteria of sustainability which is essential for applications in the handling and storage of renewable energy sources. Donaldson is a renowned worldwide provider of filtration systems that improve people’s lives, enhance its customers’ equipment performance, and protect the environment. It is a technology-driven company committed to satisfying its customers’ needs for filtration solutions through innovative research and development, application expertise, and global presence. The company’s approximately 12,200 employees contribute to its success by supporting customers at its more than 140 sales, manufacturing, and distribution locations around the world. Donaldson is a member of the S&P MidCap 400 and Russell 1000 indices, and its shares trade on the NYSE under the symbol DCI. Floating cranes are playing an increasingly important role in ship-to-ship and ship-to-shore bulk loading, unloading and transshipment of numerous cargoes including biomass. Because they require no port infrastructure, floating cranes are flexible and can operate within or outside of ports. The importance of floating cranes is particularly driven by port charges and bulk carrier size. Higher port charges are generally causing operators to reconsider their loading and unloading operations, moving them away from the quayside. Larger bulk carriers and the resultant deeper draughts mean that the ports need to be deepened or the bulk carriers must lighten their cargoes before entering port. Due to their flexibility and high throughput capacity, NKM Noell’s lemniscate floating cranes are increasingly used in The Netherlands to transship cargo from bulk carriers into barges for further shipment. Predicting these developments, NKM Noell started to develop an advanced floating crane concept in 2005. Computer simulations, interviews with crane drivers and 30 years of experience showed that crane throughput could best be increased, not by substantially increasing the hoisting capacity, but by increasing luffing and slewing speeds. With the intention to develop a floating crane, stability considerations played another major role. A crane can have a high theoretical throughput, but the actual throughput is largely determined by the skill of the crane driver. The driver must be able to see the cargo, must not be subjected to excessive vibration and acceleration forces, must have easy access and must feel safe. Moreover, a theoretically fast crane is only effective if it remains operational. This puts demands on reliability, availability and the life of the crane. Essentially, the crane must be economical to operate and be environmentally friendly. In this respect, one optional design feature of the NKM Noell floating crane is the use of a flywheel to ‘charge’ the generator-sets located in the pontoon. The flywheel itself is ‘charged’ using regenerated energy from the movement of the grab. This feature reduces energy consumption and smoke emissions. Based on the principles described above, NKM Noell designs and builds cranes to customer specification. Each crane is tailored to the customer’s specific needs. NKM Noell can also supply the pontoon on which the crane is installed and can arrange the installation. Life-time maintenance is available via a service level agreement and any delivery is backed by the comprehensive NKM Noell guarantee. Even though custom-built floating cranes are complex, NKM Noell’s continuous improvement approach is continually driving down delivery times. NKM Noell Special Cranes GmbH is a renowned supplier of special cranes and special handling equipment. In addition to advanced special cranes, it can also supply R&D, consulting, feasibility studies, design, engineering, manufacturing, shipping, installation, commissioning, training and after sales service. NKM Noell is part of Groupe Reel, which was founded in 1946, with its head office in Lyon, France.